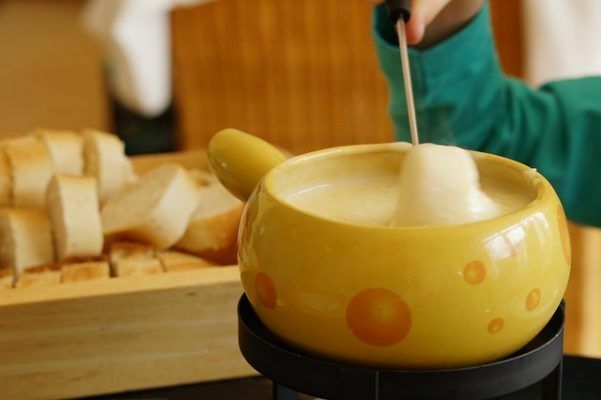 Fondue, a classic of traditional Swiss cuisine is the ideal dish for a friendly get-together around the table, thanks in particular to the light-hearted rituals observed during the meal: If a cube of bread is lost in the fondue pot by a man, he has to buy a bottle of wine or a round of kirsch for everyone. If a woman loses her bread cube in the pot, she has to kiss every male in the gathering. Fondue is a blend of many cheeses, but it always includes Gruyère and Emmenthal. I personally like to add cheeses like Appenzeller or Vacherin (if these are not available, you should add two-thirds of Gruyère and one-third of Emmenthal). As cheese fondue is rich is fats, you can replace some of the bread cubes with lightly blanched vegetables (cauliflowers, broccoli, small potatoes) and raw vegetables (cherry tomatoes, whole mushrooms) for a meal that is as light as it is delicious and colourful. Don’t forget to stir the fondue by dipping some bread or vegetables into it, to stop it from sticking too much to the bottom of the fondue pot. This thin crust of cheese that gets cooked and stuck to the bottom is called a religieuse (meaning ‘nun’ in French) and it is an absolute delicacy for food lovers. Happy New Year! Originally published in the Journal de Montréal on December 30, 2006.